Contributions from various people (Unix makefiles, etc). 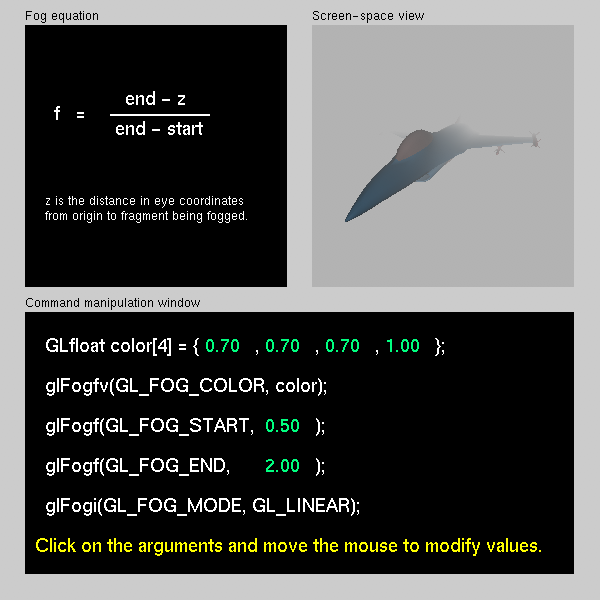 The fog tutorial program (shown at right) demonstrates how to use depth cueing (or fog) in OpenGL. It includes command panels that allow dynamic update of the parameters for linear, exponential and exponential2 fog functions. The fog color can also be dynamically changed. 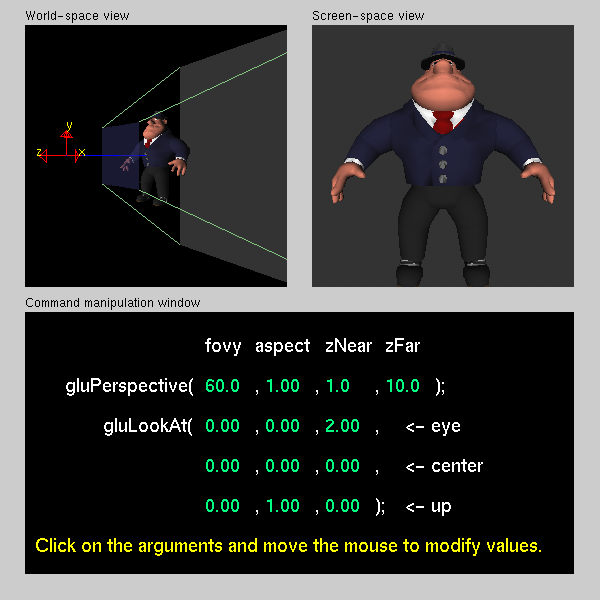 The lightposition tutorial program (shown at left) demonstrates how lighting position is effected by the viewing transformation. The order in which the light position and the viewing transform are established is configurable, as are the parameters for the position and transform. 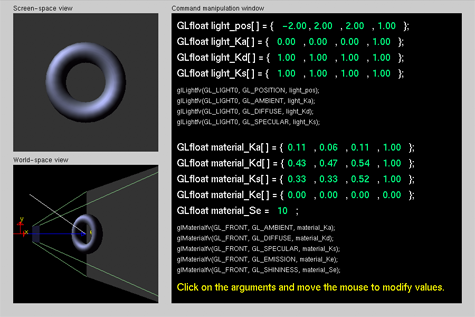 The lightmaterial tutorial program (shown above) demonstrates how OpenGL lighting and material properties interact and effect each other. All material & light properties are tweakable. 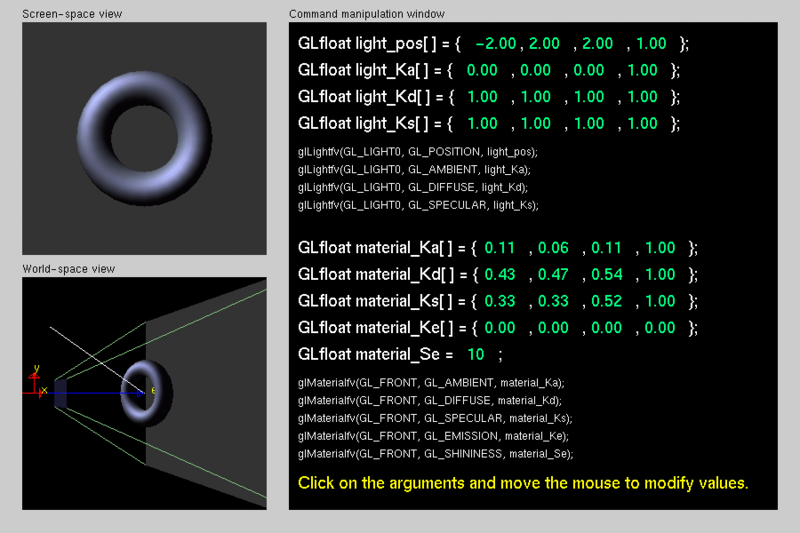 A second command panel allows spotlight parameters & attenuation factors to be changed. 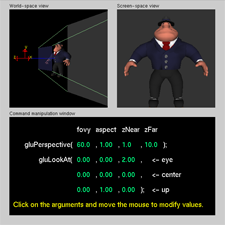 The projection tutorial program (shown at right) demonstrates how the many types of projection transformations work. A command panel is included for gluPerspective(), glOrtho() and glFrustum(). 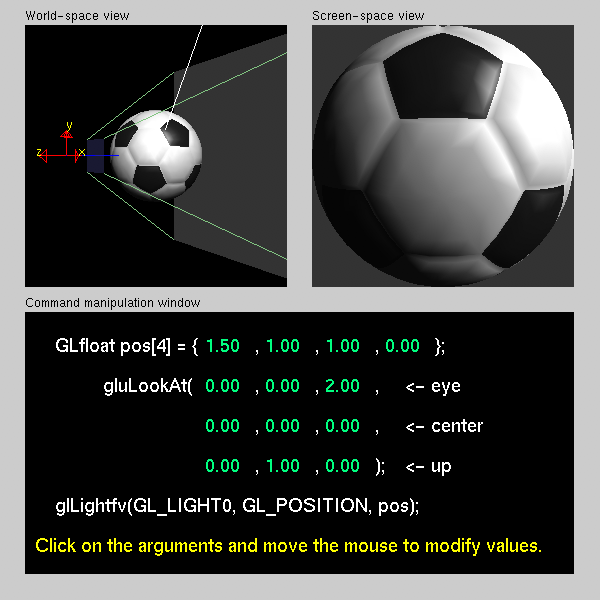 In addition, the viewing transform can be modified via the gluLookat() function. 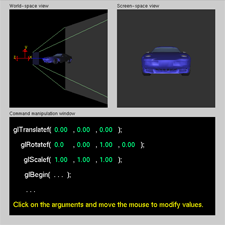 The transformation tutorial program (shown at left) demonstrates how the basic transformations of rotate, translate and scale operate in OpenGL. The order of the transforms can be changed to see how that effects rendering. The texture tutorial program (shown above) demonstrates how OpenGL texturing works. Specifically, the texture coordinates for a polygon are provided for manipulation as are the polygons coordinates themselves. 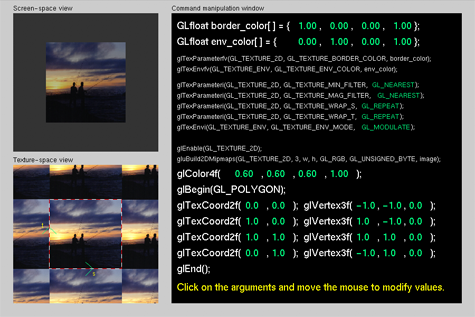 The texture parameter & environment attributes are tweakable. 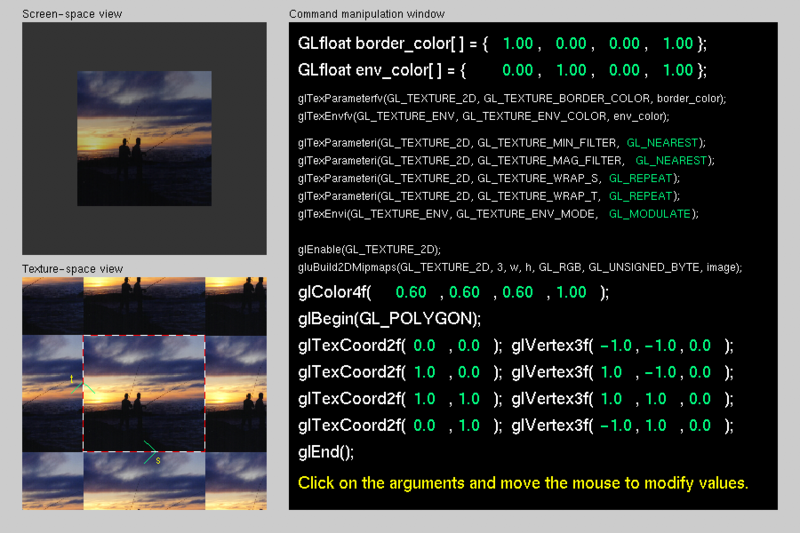 A separate command panel allows manipulation of the texture matrix. 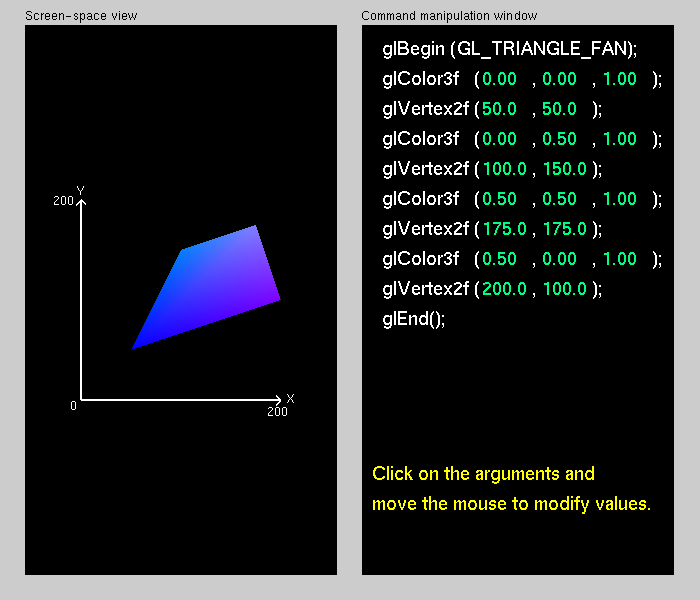 The shapes tutorial program (shown at right) demonstrates how the many types of primitives work. A command panel for each primitive type is included. 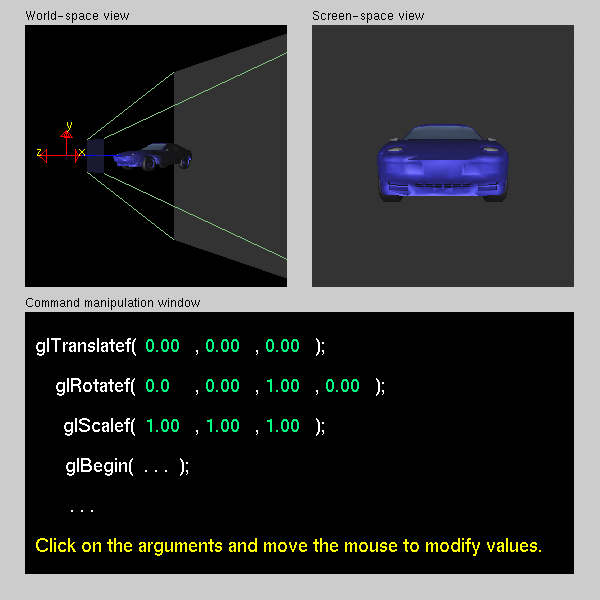 This tutorial was written by Mason Woo (mason@woo.com).